The Meteorological Satellite Applications Award Grant was established by the National Weather Association (NWA) in 1999 to stimulate interest in, and foster the study and use of, satellite remote sensing data in weather analysis and forecasting. The scholarship was transferred to the National Weather Association Foundation in 2017. The award winner receives a $500 Grant, free registration at the NWA Annual Meeting to present their paper, and a stipend of $500 to help cover travel and hotel expenses. The award is sponsored by Frances Holt, a member of and past Chair of the Remote Sensing Committee. Undergraduate students are invited to write an original paper on meteorological satellite applications. Themes of the papers may include original research, case studies, or a survey of applications. The recipient of the award will receive a Grant of $500, free registration at the NWA Annual Meeting to present their paper, and a stipend of $500 to help cover associated travel and hotel expenses. The student must be enrolled as an undergraduate at the time the paper is written and be in good academic standing at the college or university attending. The student also must be a U.S. citizen or hold permanent resident status. Membership in the National Weather Association (NWA) is encouraged, but not required. To join the NWA, click here. Submission of Papers: Student papers should not exceed ten (10) pages including photographs and appendices. 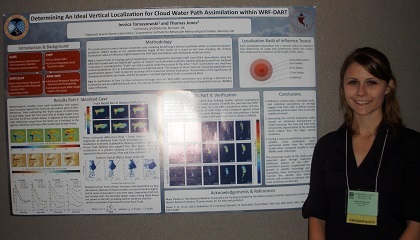 2014 NWA Meteorological Satellite Applications Award Grant winner, Jessica M. Tomaszewski from the University of Oklahoma, Norman, OK: "Determining an Ideal Vertical Localization for Cloud Water Path Assimilation within WRF-DART"